Surf’s up at Intertops Casino this holiday season as players work their way up the Surfer Scoreboard to claim their share of the $80,000 in Surfing Santa Christmas bonus money the popular online casino will be giving away this month. Win or lose, Intertops Casino players earn points every time they place a wager. From now until January 9th, top point scores will be posted on the site’s Surfboard Scoreboard. On January 11th, the top 20 players will receive bonuses from $200 - $500 each for a total of $7,000 in free bonus money. Intertops Casino is one of the world’s oldest and most trusted online casinos. The US-friendly online casino features more than 300 instant-play and download games including 3 and 5 reel slots, multi-hand video poker, and traditional casino favorites like Blackjack, Roulette and Keno. It hosts daily slots tournaments where players can play against other players on some of the site’s most popular slot machines such as Crystal Waters, Loose Caboose and Texan Tycoon. This month slots tournaments played on the Christmas-themed Naughty or Nice slot machine are bound to be popular. Intertops welcomes players from around the world and is known for quick, hassle-free deposits and withdrawals and excellence in customer service. 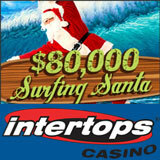 Surfing Santa Christmas Bonus details and Surfer Scoreboard (updated daily) are available at: http://casinopromotions1.intertops.com/Surfing_Santa.html.